ON THIS DATE (June 12, 2010) ... Two innings into the game, Daniel Nava, who a few short years ago was laundering jerseys for the University of Santa Clara baseball team that had cut him, took Philadelphia Phillies starter Joe Blanton to the cleaners with a grand slam on the first major league pitch he saw. Nava had the opportunity to make this one of the greatest performances by a rookie in major league history when he came to plate in the third inning with the bases again loaded: Drew (single), Varitek (walk), and McDonald (infield hit). This time, Nava struck out on a half-swing, but Marco Scutaro followed with a two-run single and Dustin Pedroia added an RBI single. Nava is just the second player to hit a grand slam in his first at-bat with the Red Sox and the second in major league history to hit a slam on his first pitch, joining Kevin Kouzmanoff, who did it for the Indians in 2006. 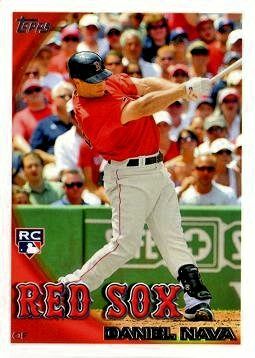 The last Red Sox player to hit a home run in his first at bat was Eddie Pellagrini on April 22, 1946. Rip Repulski was the last player to hit a home run in his first at bat with the Red Sox on April 10, 1960.